Not everything we teach in school is best taught through formal lessons. Extra curricular activities and clubs provide plentiful opportunities for students to develop skills, leadership, and creativity. For years, schools have sponsored teams for Future Problem Solving, Destination ImagiNation and other problem-solving ventures. Now another type of club has emerged for our technical age: Hacker Scouts. I’ll admit, my initial reaction to the term “hacker” was not a positive one. I have no interest in helping students use their creativity in malevolent ways. But hacker scouts don’t break into computers, they build things, in the best DIY tradition. They are “makers” of all types. A recent NPR broadcast explained the programs. You can hear the (5 minute) broadcast by clicking the first link, or read the NPR website in the second. In case you didn’t click either, here’s a short excerpt to give you the flavor. Ace Monster Toys is a hacker space in Oakland, Calif., where members share high-tech tools. 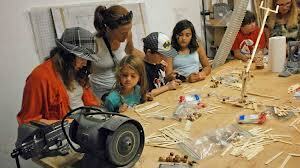 Normally, grown-ups congregate there, working on electronics or woodworking projects. But two Sundays a month, the place is overrun by 50 kids and their parents for the gatherings of a group called Hacker Scouts. The kids in Hacker Scouts are not breaking into computer networks. They make things with their hands, and at this particular meeting they are learning to solder and are building “judobots,” small robots made out of wooden Popsicle sticks. On this warm fall day, Alicia Davis, 10, is wearing a wool hat she knit herself. As her dad stands nearby, she sews an LED bracelet with conductive thread. Pretty cool, indeed. The official Hacker Scouts organization is sponsored by Ace Monster Toys, a hackerspace in the San Francisco area. Hackerspaces like Ace are found across the globe, places where makers can meet, share equipment, and collaborate. If there is a hackerspace in your area, it might be a place to investigate options for Hacker Scouts or something similar. 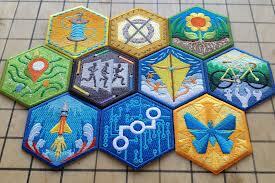 But with or without an official Hacker Scouts organization, young people can earn hacker-type badges through DIY.org. The DIY website is full of projects to try and “Challenges” that can be used to earn patches, like virtual scouting badges with a twist. Think about the creativity and fun involved in earning patches like Animator, Beekeeper, Circuit Bender, Instrument Maker or Fort Builder. Makes me want to sign up! There is a Parents area of the website, good for parents or educators, and a blog to inspire adults and children alike. So listen to the DIY anthem: Build, Make, Hack, Grow, then join in! « What Do You Have the Courage to Do?